Carotid endarterectomy is a surgical procedure used to correct carotid stenosis (narrowing of the carotid artery lumen by atheroma), used particularly when this causes medical problems, such as transient ischemic attacks (TIAs) or cerebrovascular accidents (CVAs, strokes). Endarterectomy is the removal of material on the inside (end-) of an artery. Angioplasty and stenting of the carotid artery are undergoing investigation as alternatives to carotid endarterectomy. Non-invasive procedures have been developed, by threading catheters through the femoral artery and up through the aorta, and then inflating a balloon to to dilate the carotid artery, with or without a wire-mesh shunt. However, this endovascular procedure is controversial; many investigators report an increased incidence of stroke and recommend against it (Golledge et al 2000). Surgical intervention to relieve atherosclerotic obstruction of the carotid arteries was first performed at St. Mary’s Hospital, London, in 1954. Since then, evidence for it’s effectiveness in different patient groups has accumulated. In 2003 nearly 140,000 carotid endarterectomies were performed in the USA (Halm). 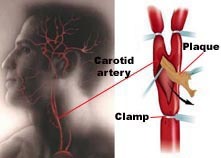 The aim of CEA is to prevent the adverse sequelae of carotid artery stenosis secondary to atherosclerotic disease, i.e. stroke. As with any prophylactic operation, careful evaluation of the relative benefits and risks of the procedure is required on an individual patient basis. Peri-operative combined mortality and major stroke risk is 2 – 5%. Carotid stenosis is diagnosed with ultrasound doppler studies of the neck arteries or magnetic resonance arteriography (MRA). The circle of Willis typically provides a collateral blood supply. Symptoms have to affect the other side of the body; if they do not, they may not be caused by the stenosis, and arterectomy it will be of minimal benefit. The North American Symptomatic Carotid Endarterectomy Trial (NASCET) and the European Carotid Surgery Trial (ECST) are both large randomized class 1 studies which have helped define current indications for carotid endarterectomy. The NASCET found that for every six patients treated, one major stroke would be prevented at two years (i.e. a “number needed to treat” (NNT) of six) for symptomatic patients with a 70 – 99% stenosis. Symptomatic patients with less severe carotid occlusion (50 – 69%) had a smaller benefit, with a NNT of 22 at five years (Barclay). In addition, co-morbidity adversely affects the outcome; patients with multiple medical problems have a higher post-operative mortality and hence benefit less from the procedure. The European asymptomatic carotid surgery trial (ACST) found that asymptomatic patients may also benefit from the procedure, but only the group with a high grade stenosis (greater than 75%). For maximum benefit patients should be operated on soon after a TIA or stroke, preferably within the first month. Complete internal carotid artery obstruction (because the intraluminal thrombus then extends too far downstream, well into the intracranial portion of the artery, for endarterectomy to be successful). Previous stroke on the ipsilateral side with heavy sequelae because there is no point in preventing what has already happened. About 3% of patients will suffer neurological complications as a result of the procedure. Hemorrhage of the wound bed is potentially life-threatening, as swelling of the neck due to hematoma could compress the trachea. Rarely, the hypoglossal nerve can be damaged during surgery. This is likely to result in fasiculations developing on the tongue and paralysis of the affected side: on sticking it out, the patients tongue will deviate toward the affected side.